A demolition party attempts to destroy the partially completed REGULUS to prevent her use by the Japanese, but manages to only cause minor damage to her stern. Bandung, Java. Governor General Alidius W. L. Tjarda van Starkenborgh-Stachouwer surrenders the Netherlands East Indies. 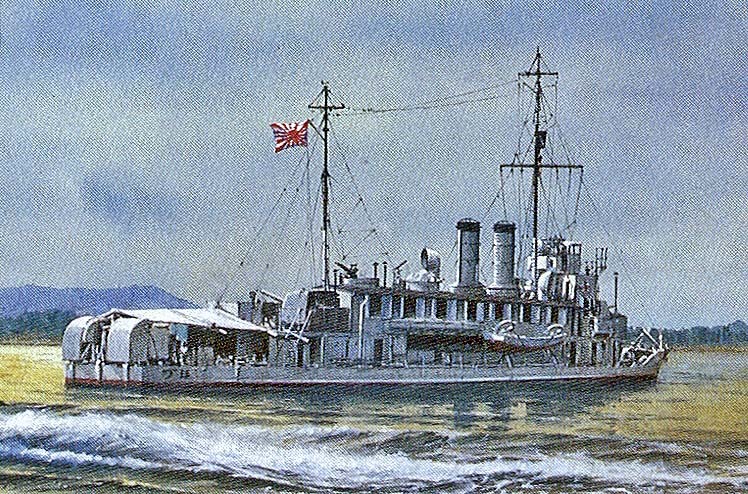 REGULUS comes under Japanese control. Surabaya. REGULUS undergoes repairs and further new construction by the IJN's No. 102 Repair Station. Attached to Vice Admiral Mikawa Gunichi's (38) (former CO of KIRISHIMA) Southwest Area Fleet headquartered at Manila. Near Sebuku Island, off Balikpapan, Borneo, NEI. NANKAI is escorting transport HOKKAI MARU. Both strike and are damaged by mines laid by LtCdr Walter T. Griffith’s USS BOWFIN (SS-287) on 29 January 1944 at 03-37S, 116-25E. HOKKAI MARU is towed to Surabaya for repairs. NANKAI is also salvaged and repaired. NANKAI is attached to Vice Admiral Fukutome Shigeru's (40)(former CO of NAGATO) 10th Area Fleet established that same day at Seletar Naval Base, Singapore. W of Surabaya. At about 0500, subchaser CH-1 and gunboat NANKAI are attacked by LtCdr William H. Hazzard's USS BLENNY (SS-324). Hazzard fires a total of 12 torpedoes in a night surface radar attack and claims four hits that sink NANKAI at 05-26S, 110-33E. At about 0700, BLENNY finds, shells and sets CH-1 on fire, but the subchaser manages to get away. The Dutch civil navy, tasked with transport of government goods, charting sealanes and countering piracy, was known as the Gouvernementsmarine. Some sources list NANKAI as launched on 21 May '43. Thanks for assistance go to Dr. Higuchi Tatsuhiro of Japan.